3 Bedroom Detached Bungalow For Sale in Ilkeston for Offers in excess of £210,000. Individually designed three bedroom detached chalet bungalow in the heart of Stanley Common village. 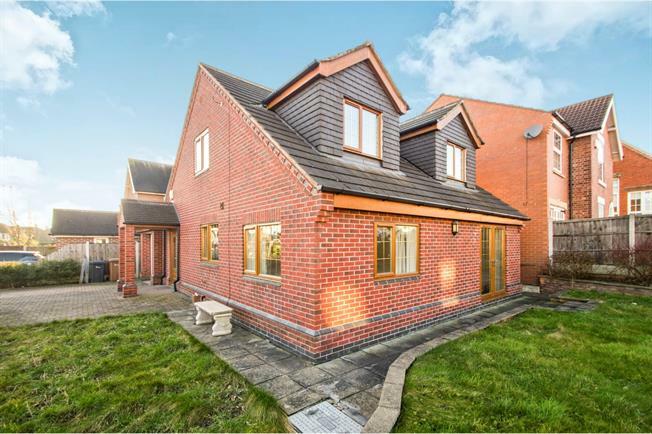 The property is situated on a corner plot and benefits from a driveway and single garage. In brief the accommodation comprises of entrance hall, kitchen, open plan lounge/diner with patio doors, ground floor bedroom and bathroom. To the first floor there are a further two double bedrooms and an en-suite shower room. Viewing is recommended to appreciate the size of accommodation on offer. The property is being sold with no upward chain!! Double glazed uPVC door to the side, radiator, fitted base cupboards with a rolled edge work surface. Double glazed uPVC patio doors to the front, double aspect double glazed uPVC windows facing the front and side, two radiators, television point. Rolled edge work surface, built-in wall and base units, one and a half bowl sink with drainer, electric oven, gas hob, overhead extractor, integrated fridge/freezer, washing machine and dishwasher, double glazed uPVC window facing the side, radiator, tiled flooring. Double glazed uPVC window facing the side, radiator. Low level WC, panelled bath, pedestal sink, double glazed uPVC window facing the side, heated towel rail, extractor. Double glazed uPVC window facing the front, radiator. Double glazed uPVC window facing the front and side, radiator. Low level WC, single enclosure shower, pedestal sink, heated towel rail, tiled flooring, storage into the eaves. Roller door to the front with power and lighting. There are gardens to the front and side of the property with a wall around. To the side of the property is a block paved driveway leading to a single integral garage. To the rear of the property is a small enclosed courtyard style garden.